As described in my last blog, I travelled with Ezzard Flowers and Athol Farmer, Noongar leaders from South West Western Australia, in April 2005 to inspect the newly rediscovered artworks at Colgate University, Hamilton, New York State, with a view to borrowing a selection for an exhibition at Katanning, W.A. This collection of mainly pastel drawings by the Aboriginal child artists of Carrolup was exhibited in Europe by Mrs Florence Rutter between 1950 and 1952. She sold the collection to an American, Mr Herbert Mayer, in 1956 and the artworks then disappeared. You can read a short version of the Carrolup Story starting here. Ezzard Flowers was interviewed by Tim O’Keefe from the University Newspaper, Colgate Scene, during our trip to Colgate University and here is a written transcript of part of this interview, as well a film clip. Ezzard talks about the Carrolup boys and their relationship with their land. He also stresses the importance of connection to land and culture, as well as art, for healing. ‘The kids at that time wouldn’t have known how significant their art was, but it was part of their culture and a part of their life, and also a part of their healing, from being away from their country. I think that’s the reason why they did most of the paintings [strictly speaking, ‘drawings’—JS] that reflected the land, and also significant areas within the country that they came from, down in the Great Southern region of Western Australia. Few of the boys went on to become commercial artists. After they left the Mission, they would have been glad to get back and be with family, simply because of that void that would have been there for so many years, simply because of being on the Mission, but they would have done bits and pieces of art, probably mostly for themselves, for their personal healing, and also for their sense of passing it on to their family, or whatever. The paintings were expressed through landscaping, making reconnections back to the land, back to significant sites, and to places that they found to be a sense of healing, where they can reconnect to that place, through their painting. It might be a certain hill, or a certain river, and if that was put in the painting, that would be a part of their personal story, part of their personal healing. They were put in the Mission as part of the Segregation policy, to give them a white education, but most would have had to leave when they were 14, to reconnect with their extended families, not seeing your mother or your father all those years, and not seeing your father, who would have been wanting to pass on significant cultural knowledge in regards to cultural law, leadership and things. Most of the children would have been taken from their families and extended families when they were babies, some a little bit later on. It didn’t really stop until the new Act in 1972. With the Cultural Awareness programs we run, we talk about past history and the loss of identity, and the psychological impact that this had on the kids at that time, who would have been affected mentally and socially, in regards to not being able to sit down and tell stories any more, or to do corroborees, all that kind of stuff. But what I’m trying to do, as a next generation leader, is to pass on what’s been lost in those Mission days. Passing it to the new generation, especially in regards to identity. 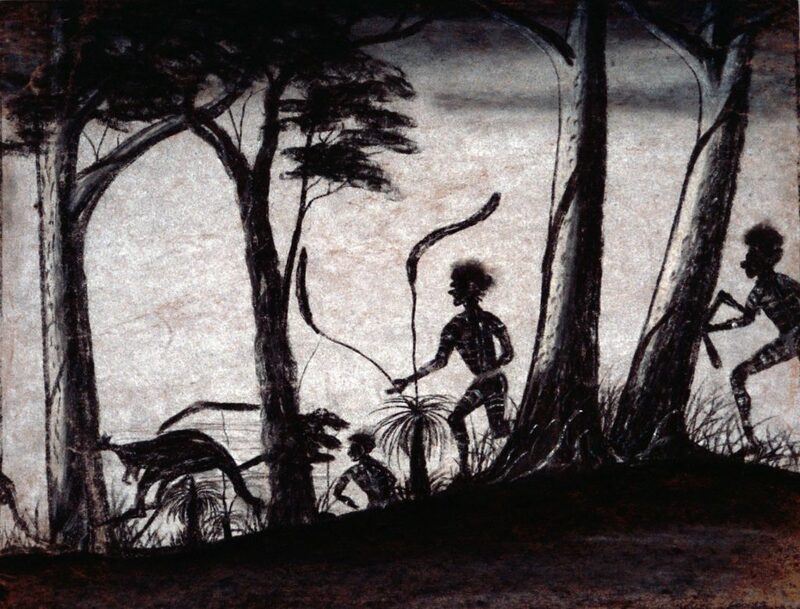 Some of the paintings from the Carrolup period reflect the scenes of corroborees, and markings on the men doing the corroborees, which is very, very important to the youths of today in regards to their identity as part of a Noongar nation. And I’m also wanting to pass on knowledge of Aboriginal healing arts. It’s not just about painting, but there’s other stuff as well, that incorporates the bush as a healing medium, and also things in the bush. Going back hunting, and fishing, and reflecting.